After six years on the air, Dr. Oz says he s making some changes to his popular TV show, viewed daily by millions. Following the media firestorm from that letter from physicians across the country, Oz has now admitted publicly he was wrong to endorse so many miracle weight loss pills. Most recently, he announced the addition of Dr. Michael Crupain to his staff. His duties would include (according to the press release) being responsible for researching and vetting scripts, evaluating expert guests, ordering and editing medical animations and overseeing liaisons with the show's Medical Advisory Board. It went on: He will also lead efforts to enhance the show's ongoing dialogue with the medical community." 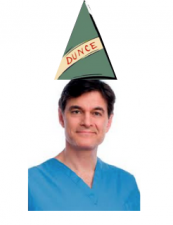 In essence, Dr. Oz hired a fact checker who has an MD. This sounds like a win for all involved. End of story right? To our dismay, as ACSH friend Alex Berezow, PhD, points out over at Real Clear Science, fact checker might be a bit of a stretch: Finally, facts matter to Dr. Oz. Right? Well, no. Dr. Michael Crupain, as it turns out, is an anti-GMO activist. And he has made a name for himself at Consumer Reports by spreading misinformation about agriculture and biotechnology. So essentially, it's a swing and a miss. Dr. Berezow continues: In 2011, he penned this diatribe against GMOs that is one untruthful statement after another. To support his claims, he relies on the research of junk science organizations, such as the Union of Concerned Scientists and other organic food advocacy groups. Thus, he ends up regurgitating the same myths that organic foodies use to support their very expensive, albeit science-free, lifestyles. One thing that is clear with this hiring is that Dr. Oz thinks this is all just about GMOs -- and if he simply addresses that issue, then he's answered (or silenced) his many critics. But in truth, we at ACSH have criticized him for so much more. The main reason we take issue with Oz is that because he wields so much influence through his Dr. Oz Show (please note: due to formatting issues with wordpress we cannot publish this name as Mehmet wishes), frequent radio and TV appearances, and his America s Doctor moniker, Dr. Oz could be a tremendously positive force for good science driving public health. But instead he spends his time on dubious topics like talking to the dead. ACSH s Nicholas Staropoli adds: Initially, we were excited to hear that Oz has made strides to finally respond to our (and others ) criticisms of his show. However, that excitement was swiftly tamped by Alex s well-researched piece into the true identity of Mehmet s new rubber stamp. Cuprain, who comes from Consumer Reports, a group we have taken issue with before, appears to be nothing more than another name on the list of enemies of good science.